The Haftorah from the book of Shmuel Aleph (Samuel 1), 15:1-34. The connection of the Haftorah to Parshat Zachor: This week is Shabbat Zachor, remembrance. On the Shabbat before Purim we read from the Torah about the commandment to destroy the memory of the Nation of Amalek. Why? Because when the Israelites miraculously left Egypt, all the nations of the world revered and feared them. All, except the Amalekites, who attacked, because of their jealousy of Hashem’s chosen people. As the saying goes, “the only thing worse than losing, is winning.” Envy breeds the poisonous attitude, “if I can’t be on top, then I’ll just take you down”. This national “mentality” was despised so much by Hashem that he commanded the Israelites to kill all the Amalekites. With the upcoming holiday of Purim, we are reminded to destroy the memory of Amalek, as Haman descended from Amalek. The storyline of this week’s Haftorah: Samuel, the last of the Shoftim (Judges of Israel), appoints Saul the first king of Israel. The nation of Israel was given three commandments to fulfill upon entering the land of Israel: 1) Appoint for yourselves a king. 2) Kill all the Amelekites. 3) Build a Holy Temple for Hashem. The Prophet Samuel commands King Saul to wipe out the nation of Amalek, and to destroy all of its men, women, children and even all of its animals. Why the animals? Because the Amalekites knew sorcery and were able to “morph” themselves into animals to avoid danger. Just before Saul is about to attack the Amalekites, he warns the Kenites to run for their lives. The Kenites were a tribe of semi-nomadic metalworkers. Moses' father-in-law Yitro was a Kenite. Yael, who killed Sisera by driving a spike through his head, was also a Kenite. While killing off most of the Amalekites, Saul has his doubts and decides not to do the job completely. The Haftorah reminds us of the mitzvah to decimate Amalek. Saul neglects to fully execute many of the animals. And worse, he doesn’t kill the King of the Amelekites, Agag! This turns out to be Saul's big blunder. That night, Hashem appears to Samuel in a “vision” and informs him to dethrone Saul. Afterwards, Samuel couldn’t sleep. The next morning Samuel asks Saul why he didn’t finish the job completely. Saul tries to "blame shift" it on his soldiers, but Samuel sets him straight and says that as king he was responsible to make sure the job was completed. 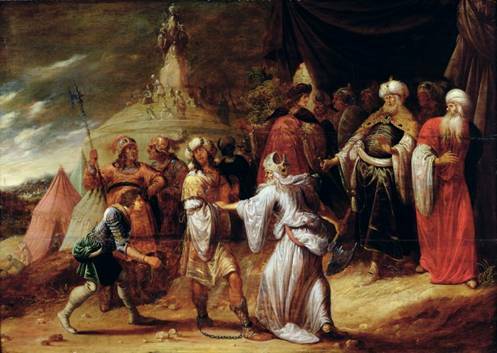 As Samuel turns to walk away, Saul tears the corner of Samuel’s robe so as not to let him go. This was symbolic of the Kingship being ripped away from Saul. The Haftorah ends when Samuel kills Agag, the king of Amalek, himself. The meaning of his name is "The Lord heard her," which refers to the prayers of his mother, Hannah, who had been childless prior to his birth. Was born in Ramat-Tsofim in the hill country of the tribe of Ephraim; He was raised under the tutelage of Eli the Kohen Gadol (High Priest) in the Holy Temple. Prophesied for 100 years, from 1070-970 B.C.E. He was the 16th and the last of the Shoftim (Judges), writing his own book which covered 120 years. Samuel was dynamic and unwavering. Was known as "The Reluctant King maker." He also appointed King David as Saul's successor to the throne over the Nation of Israel. Samuel the prophet is buried in Jerusalem. Some notes about King Shaul’s Biography: Saul was the first King of Israel, though ultimately failing at this job. Saul was a great Tzaddik (righteous person) and also a prophet. He was very handsome, modest, and innocent. Saul was a military hero. Once, upon learning that Goliath had captured the Tablets, with the Ten Commandments written on them, Saul marched 60 miles from Shiloh, and took them back in one day with the help of an Angel. Famous Phrases: Shmuel Aleph (Samuel 1) 15:29 (a wonderful song) “Netzach Yisrael Lo Yi'Sha'ker”. The Glory of Israel does not change! Haftorahman's lesson of the week: I call this one the "Frank Sinatra" mitzvah. It’s the one that you say, "I'll do it my way". It is of the utmost importance for every person to follow the Torah's directions exactly. Saul was a great man, however he did not complete Hashem's request to kill off Amalek completely. Look at what happened to him. He was dethroned and led a miserable life. Was it worth it? Most Jews will do many mitzvahs correctly, however there is usually one mitzvah that each person says "Hey! Wait a minute, everything else I'll go along with, but this one "I'll do it my way ". What is your Frank Sinatra of Mitzvahs? Lashon Hara? Whatever it is, tell the truth to yourself, and then begin to modify your behavior a little bit at a time. Hashem will take notice of your outstanding behavior and respond positively to your actions. 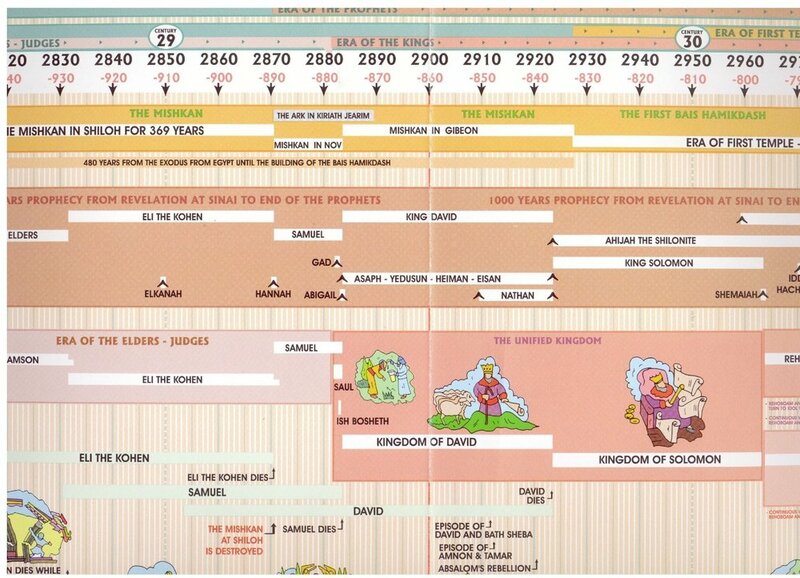 Timeline: This Haftorah took place approximately 2890 years ago. Map: The Haftorah takes place in Gilgal.